Of all the "most anticipated" movies ever claiming that title, it's hard to imagine one that has caused so much speculation and breathless expectation as Christopher Nolan's final chapter to his magnificently brooding Batman trilogy, The Dark Knight Rises. Though it may not rise to the level of the mythic grandeur of its predecessor, The Dark Knight Rises is a truly magnificent work of cinematic brilliance that commandingly completes the cycle and is as heavy with literary resonance as it is of-the-moment insight into the political and social affairs unfolding on the world stage. 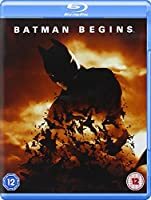 That it is also a full-blown and fully realized epic crime drama packed with state-of-the-art action relying equally on immaculate CGI fakery and heart-stopping practical effects and stunt work makes its entrée into blockbuster history worthy of all the anticipation and more. It deserves all the accolades it will get for bringing an opulently baroque view of a comic book universe to life with sinister effectiveness.